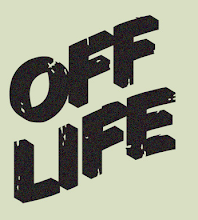 What do you think of our new logo? My family don't actually take any part in this blog! I might change it again soon, as I'm not sure it is quite what I want! 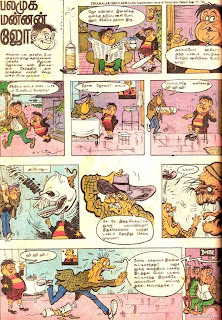 Ok, I promise my next blog will be about a comic or two from the 60's or 70's! 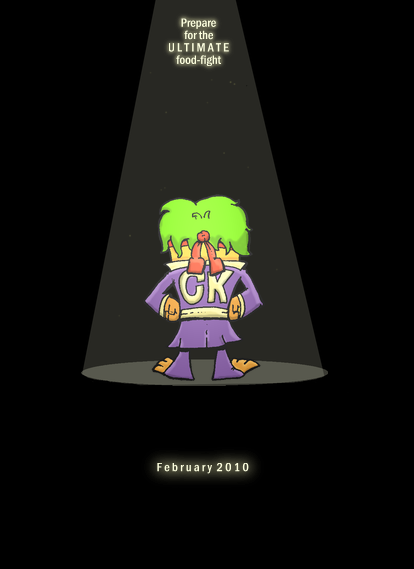 I understand that I have been writing only about new comics lately, so, I've added a poll onto the side over there -> ! Please vote, and tell me what era of comics you would like me to cover more. 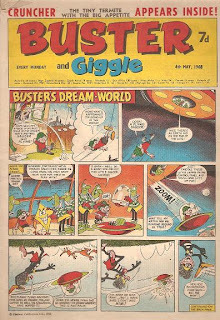 Above: Buster, 4th May 1968. UPDATE: I'm not 100% sure that the poll is working, so if it doesn't allow you to vote comment below! 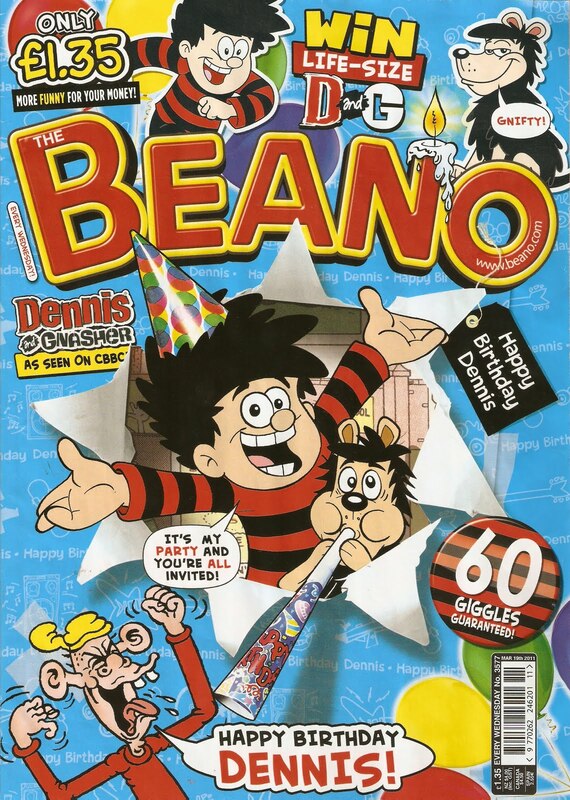 Beano 3577 And Beano 3577! 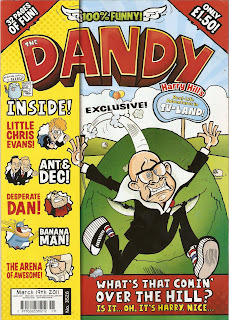 I have been getting some comments on why I always write about new Dandy comics, but not Beano's. The reason is, I never seem to get them on time! I haven't yet recieved issue 3576. #3577 is Dennis' 60th Birthday! 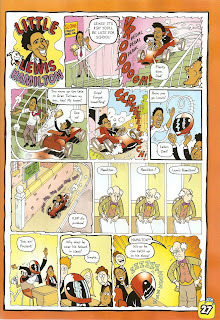 (I read about it over on Lew Stringer's blog yesterday - here) and Dennis gets a special 10 page biography. 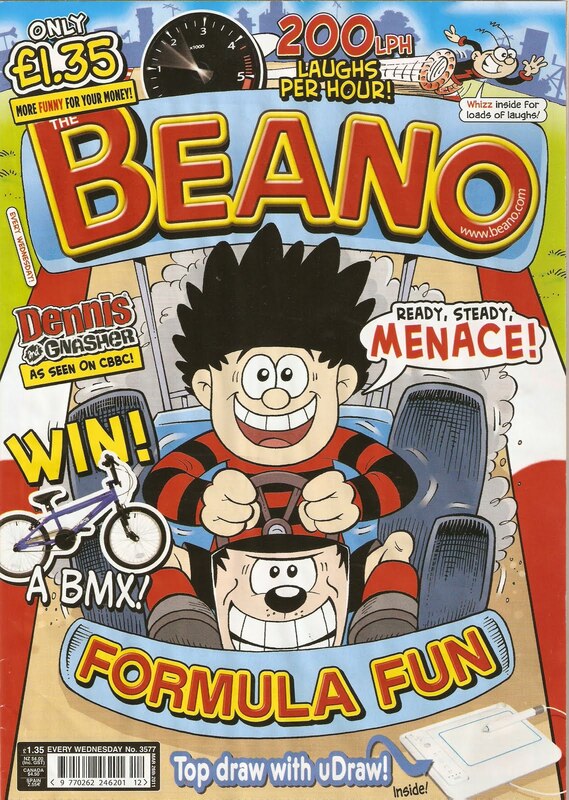 But of course, the retro beano isn't in this issue! 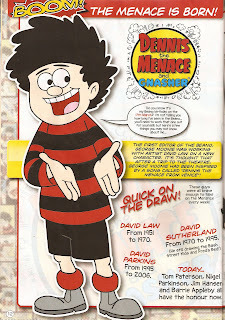 Dennis was created and drawn by David (or Davey) Law up until his sudden death in '71 - his death isn't mentioned in the comic however. The issue features the last Dennis drawn by Law. 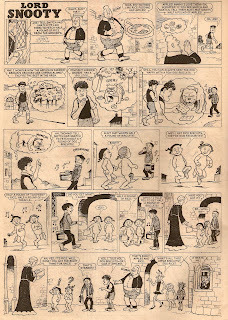 David Sutherland drew it until'95, then David (antoher David!) Parkins,and now Nigel Parkinson, Jim Hansen and Barrie Appleby. 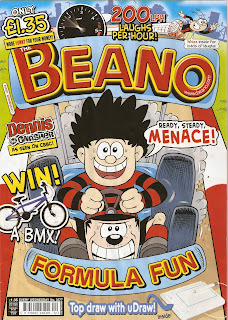 Make sure you pick up this weeks Beano: £1.35. 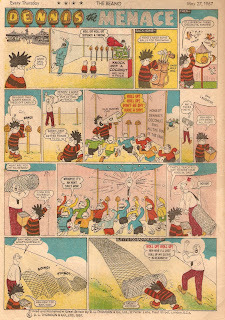 As I said in my previous blog about the Dandy, the little celebrities are back, this week it's Chris Evans. I'm not going to reveal too much, but here's one box, drawn by Nigel Parkinson. As you can tell, Chris names as many shows as he can in his sentances! 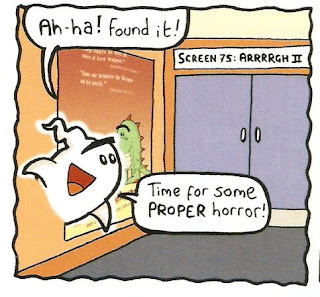 Andy Fanton has sneaked in another little thing into Boo this week (in my last but one blog, I mentioned that he sneaked in carrotty kid). 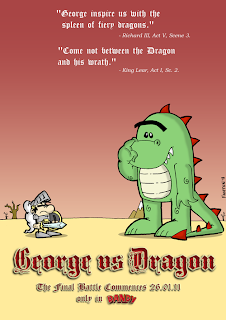 This time it's the advertisment for George vs Dragon, disguised as a movie poster. Keep a look out for anything else he does. 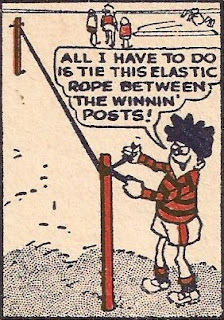 *The Dandy promises it has not heard of a program called strictly come dancing. 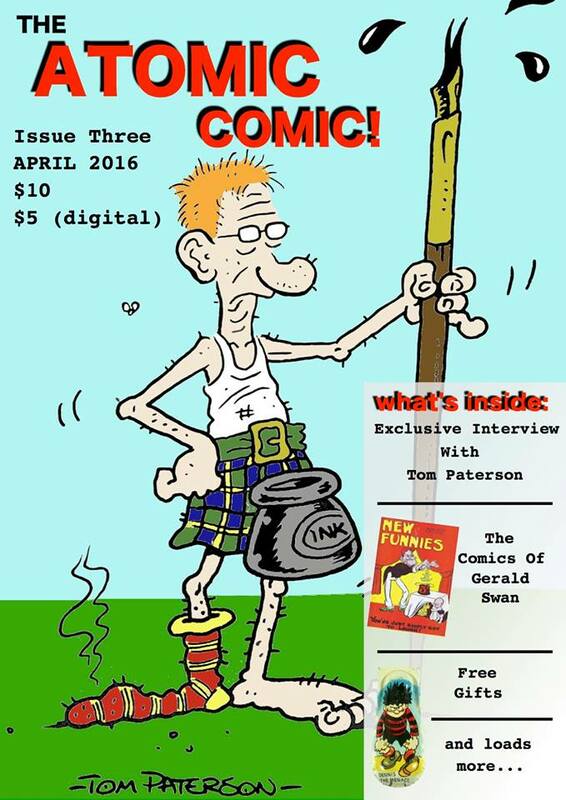 Compal Comics auction ends soon! 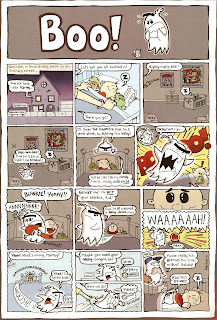 The latest catalouge on compal comics (www.compalcomics.com) ends in just a few hours! Make sure you go and check it out. 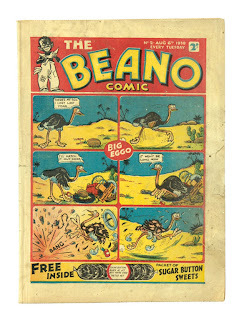 This auction features a nice condition Beano issue 2, with an estimate of 800 - 1,100. 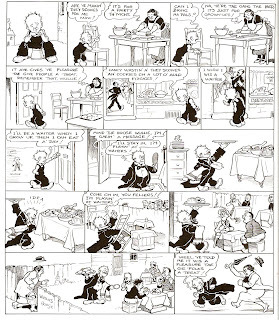 The auction also features a full year of Buster from 1963 & '67 (both of which I was tempted to put a bid in), a 1940 Dandy annual, some original artwork for frankie stein by Ken Reid. Also, there is some thunderbird oringinal artwork by Frank Bellamy at lot #178! That is expected to sell for 1500 - 2000. Make sure you go and check out the latest catolouge: http://www.compalcomics.com/! These auctions finish at 8PM UK time. Carrotty Kid in the Dandy?? 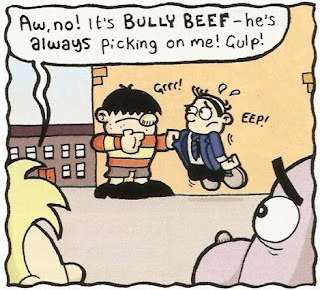 Now, just in case for some reason you missed Dandy #3522, I've scanned in the Boo from that issue and uploaded it here. Hopefully you can spot him now! If not, try looking next to the baby in boxes two and five! But don't stop there! Eagle eyed readers will notice that Marley's other cuddly toy is the Dragon from George vs Dragon! Will Andy do this again? Only time (and Fanton) can tell! Only today did I come across Andy Fanton's website. 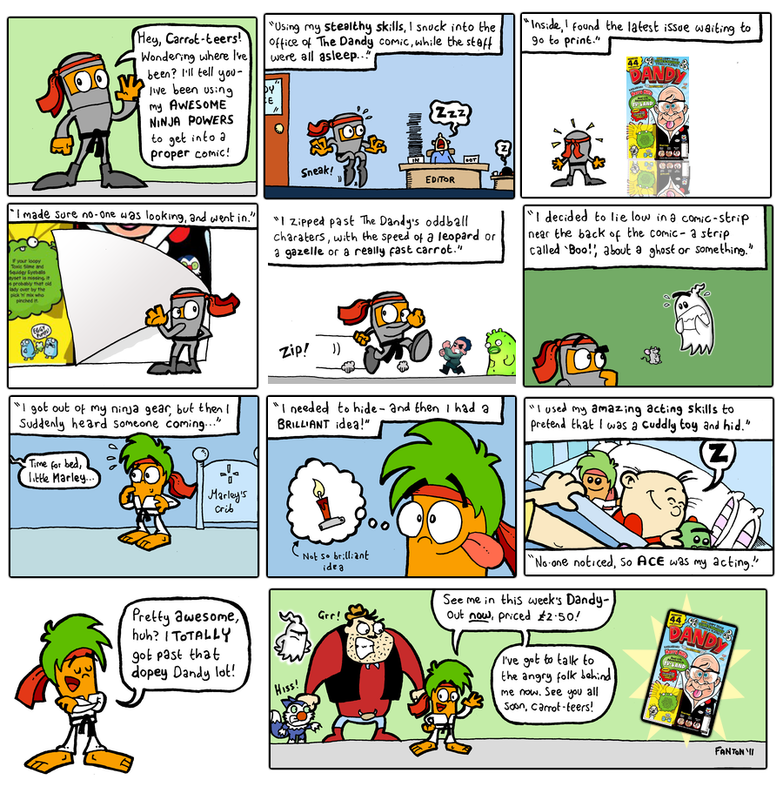 Andy is the artist behing Boo, George vs dragon, the New Harry and His Hippo, The Carrotty Kid and more! 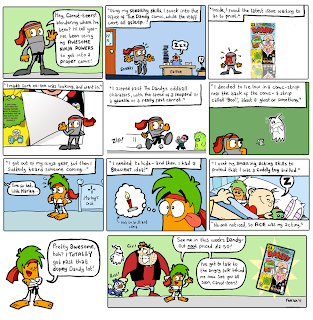 The Carrotty Kid is an online webcomic written and drawn by Andy, with occasional guest artists. As you can probably guess by the name, it is a spoof from the popular Karate Kid! 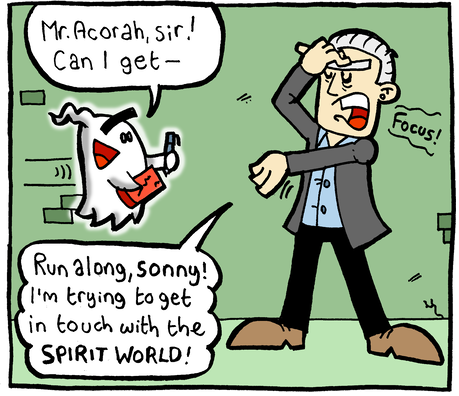 So remember to visit both those websites, and buy the Dandy Andy's work in it each week! 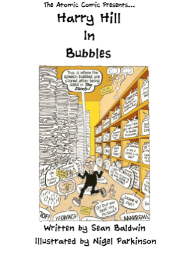 Click here to visit comicology, where I recently discovered about Face-ache in India. Drawn (I think) by Siruvar Malar who renamed face-ache to Palamunga Mannan Joe, which means Multi faced Joe. Also, when I did a bit more research on it, I discovered that earlier today Peter gray had written about it. You can see that here. 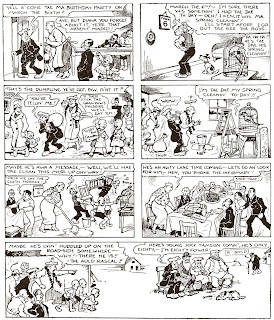 I just recieved my Dandy #3521 yesterday (from 12th Feb - must have got stuck in the post), and was surprised to see Mark Bennington had done a page for it! 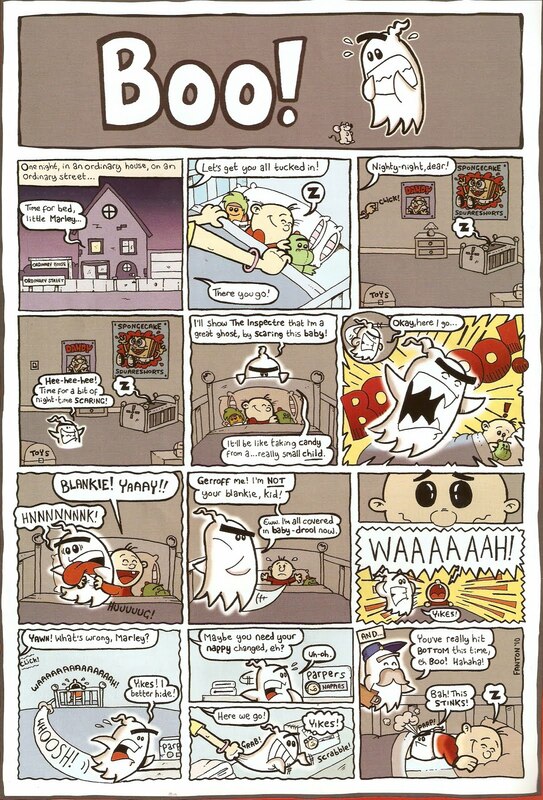 This isn't Marks best work, looks to me as though he rushed it a bit, I think that he currently works on the Lucky bag comics, maybe that takes up most of his time. Anyway, good to see his work there and I hope he'll do some more in the future. 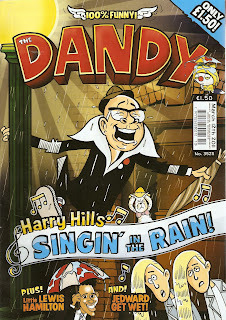 Dany #3521 - NOT on sale now, £1.50. A few blogs back I was saying how the "Little Celebrity" stories had finished. Well, they're back! 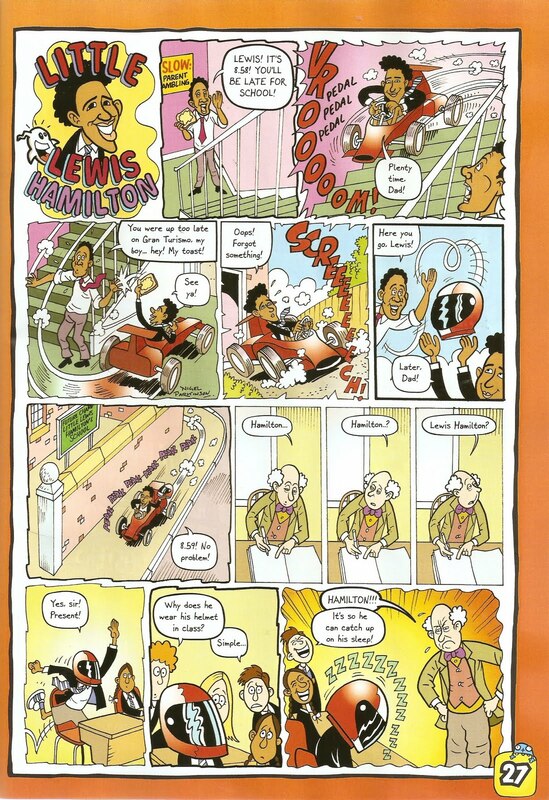 #3525 features Little Lewis Hamilton, as usual drawn by Nigel Parkinson. 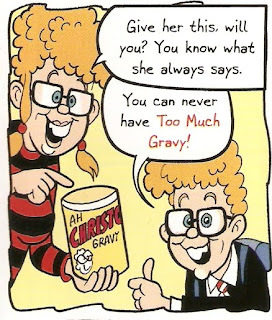 In next weeks issue it's little Chris Evans! 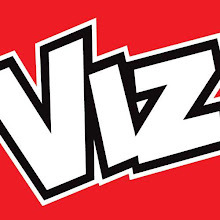 Click here to read Nigel Parkinson's blog on Celebs in comics. 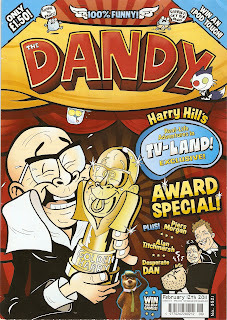 Beat the , erm, Wednesday morning blues... BUY A DANDY*!! 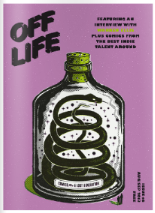 Issue 3525 - £1.50, out now. 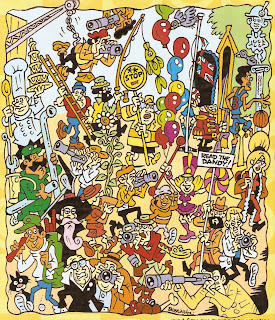 Unfortunatly I lost internet connection just before I could finish the countdown- but it was leading to Dudley's 104th Birthday. 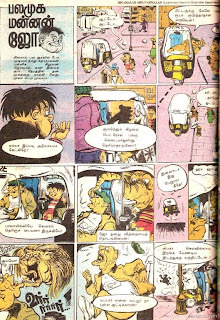 I'm sorry to say I lack internet time so I'll just upload the images that I was to write about! 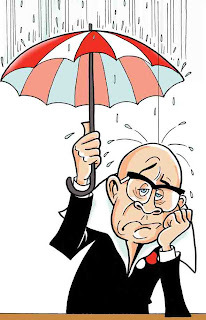 I'll try to get back to normal by next week! 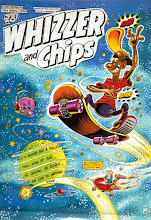 Terry Bave fans make sure you head over too http://whizzerandchipscomic.blogspot.com/ on the 10th March for the launch of a tribute page!